ECHO-LIT, LLC, IS CREATOR AND THE SOLE LEGITIMATE PRODUCER OF THIS ITEM. WE CARE ABOUT YOUR SATISFACTION. ANY OTHER COMPANY ATTACHED TO THIS LISTING IS SELLING A COUNTERFEIT REPRODUCTION, WHICH WILL BE OF LOW QUALITY OR NOT DELIVERED AT ALL. BUYER BEWARE. Each art print measures 11 x 14 inches. Printed on heavy 100 pound cover stock paper. This durable paper won't wrinkle and crease like typical poster paper. 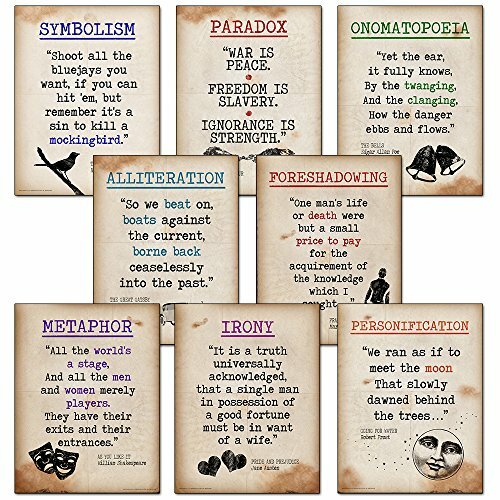 Using quotes from the most frequently assigned works in high schools nationally, this series of posters highlights eight common literary terms. We SHIP ORDERS FAST (typically within 24 hours) in sturdy packaging to prevent bends and tears. We design all of our posters in house, producing only original, unique art prints for our customers. If you have any questions about this product by ECHO-LIT, contact us by completing and submitting the form below. If you are looking for a specif part number, please include it with your message.